Right Click Enhancer allows user to add cascading menus to their right click. 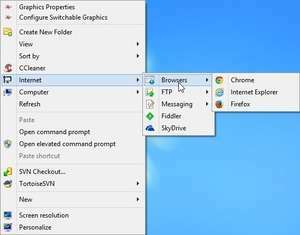 When user adds a cascading menu Right Click Cascading Menu Shortcuts Creator automatically adds an option to right click menu to add the files and folders to cascading menu by just right clicking any files or folder. Right Click Enhancer Portable provides you the ability to print or create file list of a folder by right clicking on folder and selecting one of the option, open any file in notepad by just right clicking it, open an elevated command prompt with highest privileges from any folder by right clicking it, and add the options to open System Configuration Utility. For security reasons, you should also check out the Right Click Enhancer Portable download at LO4D.com which includes virus and malware tests. Additional screenshots of this application download may be available, too.